Two parcel sizes: 60m2 and 90m2 in 3 different zones. The blue zone is closest to the sea and the yellow zone is … More » farthest from the sea, while the green zone is in the middle. 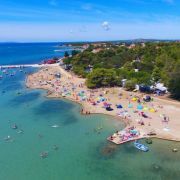 Camp Dalmacija is located in a beautiful bay in northern Dalmatia, in the small resort Privlaka, about 20 minutes from Zadar.